You are here: Home / Ethnic Groups / The People of Sumatra / Who are the Muko-Muko? 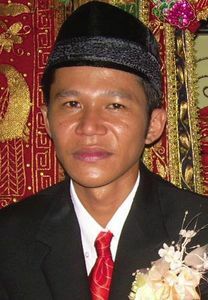 The Muko-Muko come from Bengkulu Province in southwest Sumatra. Part of their area is swampland or tidal waters where a brackish mix of ocean and river water mixes. There are also many rivers. The Muko-Muko River is the largest. The government has constructed a highway connecting Bengkulu Province to West Sumatra Province that passes through the Muko-Muko area. In everyday communication, the Muko-Muko speak a dialect of Minangkabau influenced by Malay. The Muko-Muko have many jobs, including farmers, hunters, and rattan craftsmen. Their most famous handicrafts are carved cigarette lighters. They also have community farms which produce rubber, cloves, and palm oil. The kinship system is matrilineal, which means that descent and property are passed down to the daughters in the family. This is due to the influence of the related Minangkabau people. The Muko-Muko still use their traditional leadership system. Their villages are governed by a Pasirah (village chief) and his assistants. The role of the Pasirah is to safeguard stability and harmony according to their cultural customs. He also collects taxes and community fees. These fees can take the form of working three days every year for the village head or giving money amounting to the same value of the three days of work. Other fees are paid to get a certificate of marriage, certificate of divorce, peace treaties, and permission to court a young maiden. The Muko-Muko use the term kaum to refer to a group of families. The kaum is led by the clan chief and his assistants. There are five clans that are still growing. The most famous aspect of the Muko-Muko culture is the Gandai dance. This dance is similar to the Malay dances but has been influenced by the Minangkabau style of dancing. Islam is the religion of the majority of the Muko-Muko, but in everyday life they still hold to animistic beliefs. At the core of these animistic beliefs is the effort to get protection from spirits using occultic power to control good and bad spirits. They are very afraid of the spirits of deceased mothers who died giving child birth. They also worship large trees, rocks, natural springs, ancestral graves, and their ancestors. At this time the Muko-Muko need agricultural assistance, particularly with their community farms, so that the farms can be better managed and improve people’s standard of living. They also need Indonesian language teachers because many of the Muko-Muko cannot speak or even understand Indonesian.